Swedish fashion technology company PFO are treating iPhone users to free Halloween downloads of their personal safety app. 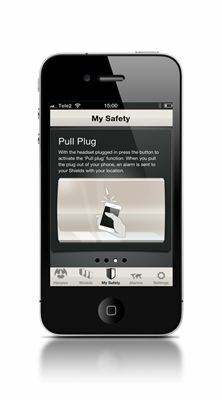 The PFO Shield app is a top-rated lifestyle app with the innovative, instinctive and discreet 'Pull Plug' alarm function which alerts chosen contacts with your location simply by pulling your headset out of your phone. Halloween is always a time of concern for safety. Most of us feel that unease of not knowing who are behind those masks. The PFO Shield app allows you to alert your parents or closest friends with your location by pulling your headset cord out of your phone, letting go of your phone, pressing an alarm button, or setting a timer. For example, with the Pull Plug function keep your phone in your pocket with your headset plugged in. If you feel your safety is compromised simply pull the headset cord out of your phone. 'The thing I love about this function is that it's very discreet and that the phone stays in my pocket which lets my parents see where I am once I pull the alarm. ' says app user Alice Eriksson. The PFO Shield app is available on iTunes for your free download during Halloween and the following weekend.